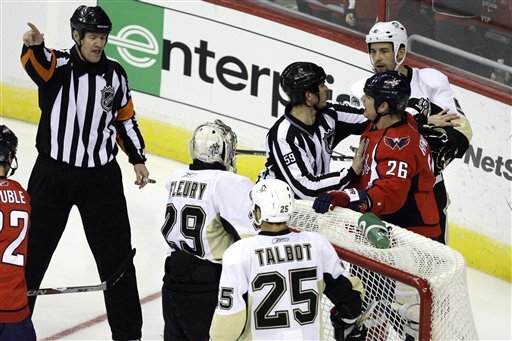 The Three 20,000 Stars of the Game: Awarding the three stars for the Pens game wasn’t especially difficult; they go to multitude of Caps fans that absolutely levitated the Verizon Center yesterday. A perfect example of an attending Pentard fan yesterday, was the drunk in the mens’ room who continued to argue with anyone and everyone even well after the game ended. 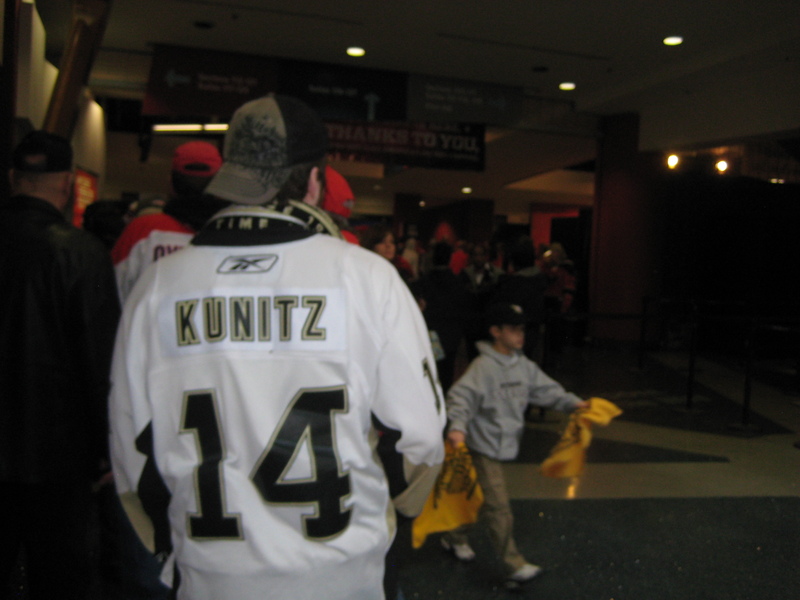 You can't spell Kunitz without "Kunt"
Never one to make a scene in such a sacred venue, I reminded him on the way out that football was more or less invented in Green Bay. That poor sucker’s lousy day had only just begun. 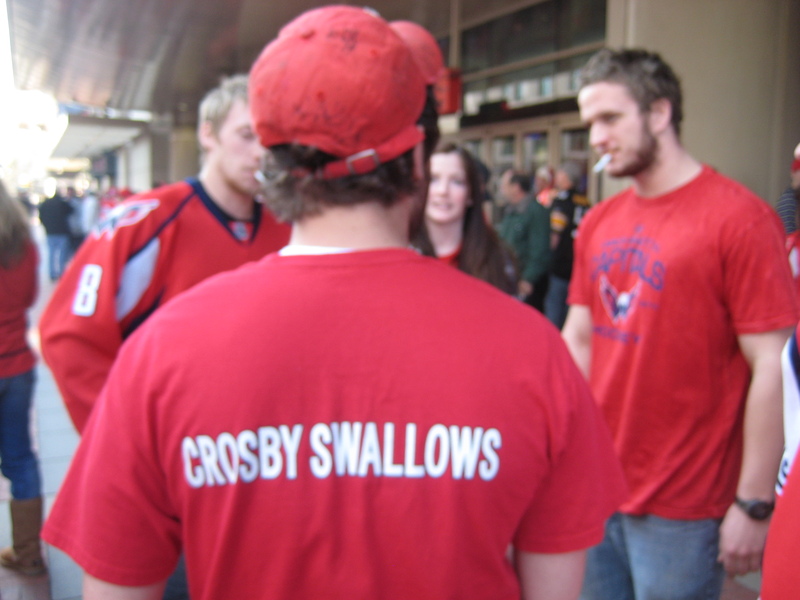 But not every Caps fan was the perfect gentleman yesterday, as evidenced by the less than family-friendly t-shirt he greeted the Penguins with outside of Verizon. 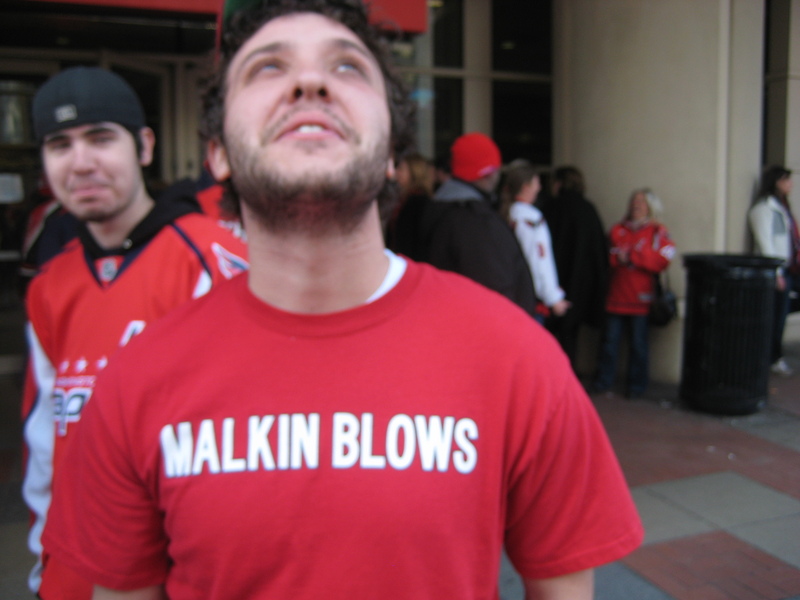 Still, we bet this guy is perfectly cool with being featured in a gay hockey blog. 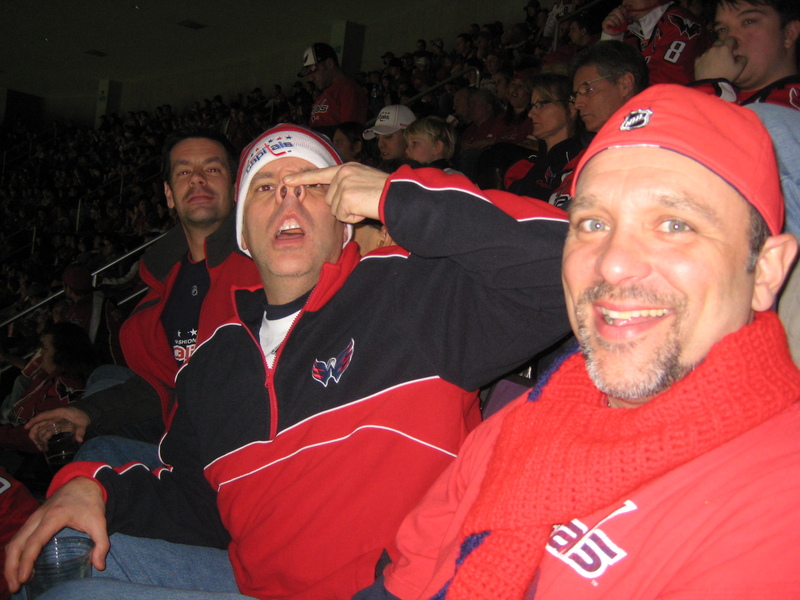 Too bad for this particular Caps fan, the targets of his disdain, Crosby and Geno, did not make the trip. Psycho Killer, Qu’est que c’est: What’s left to be said about career-criminal Matt Cooke that hasn’t already been said? Lots. It takes a special kind of psychopath to engage in a drive-by shooting like he did yesterday. It takes an especially maladjusted misfit and miscreant to do that to a former teammate. But it takes a hateful man to commit such an egregious act, so late in a game that was becoming well out of reach. And to punctuate Cooke’s cowardice, after he served his two minutes, he ran away from Matt Bradley’s invitation to discuss things further. What a little puke. And we get called fags? “I don’t wanna bag on one of our players, but… (and while he seems really nice off ice) Cooke needs to cut it out. Honestly I wouldn’t be sad if he was ever traded. I get playing with an edge, and being an agitator and all that, but enough is enough. A Fish Rots from the Head Down: Maybe the Penguins are just rotten to the core and lack the necessary leadership that would turn them from a roving mob of angry thugs into real men. Take for example Bylsma’s thoughts regarding the Steckel-Wallace match, “Bylsma was pleased that Wallace, who hadn’t played in an NHL game since 2009, stepped up to take on Steckel. Coach Bylsma, you sent a boy, an untalented hack, to do a man’s job, because there were apparently no real men on your bench that were either ready or fit to stand up and man up. PS: We didn’t see your douche hat yesterday. 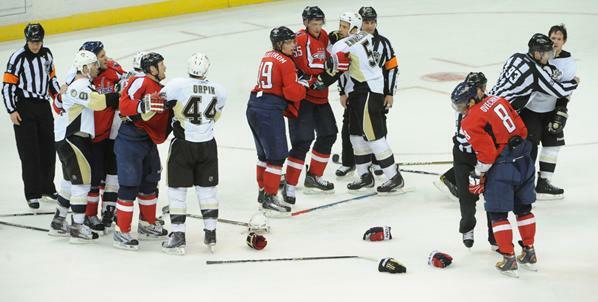 “Props to Tim Wallace for dropping the mitts to take on Steckel, but ultimately the fight was rather uneventful. Here’s to hoping and props to a goon. Stay classy Pittsburgh. Stay forever classy. Does Anybody Really Know What Time it is: Is my watch working? Dave Steckel was on the ice for less than ten minutes yesterday? He seemed like he was out there forever, and everywhere at once. What a stud. And kudos to ironman John Carlson, clocking in at almost 28 minutes, a season high. 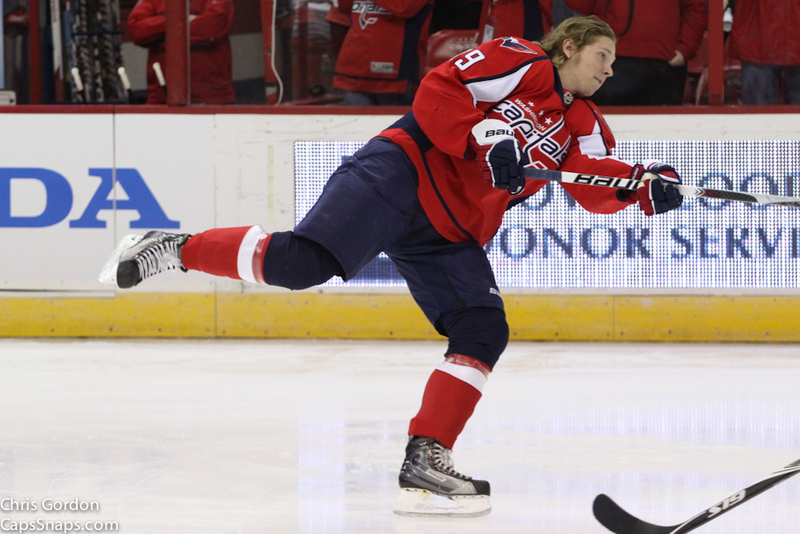 Best wishes to Mike Green and a speedy recovery for the slice and stiches he took home. Superstar Mike bleeds RED, in more ways than one. 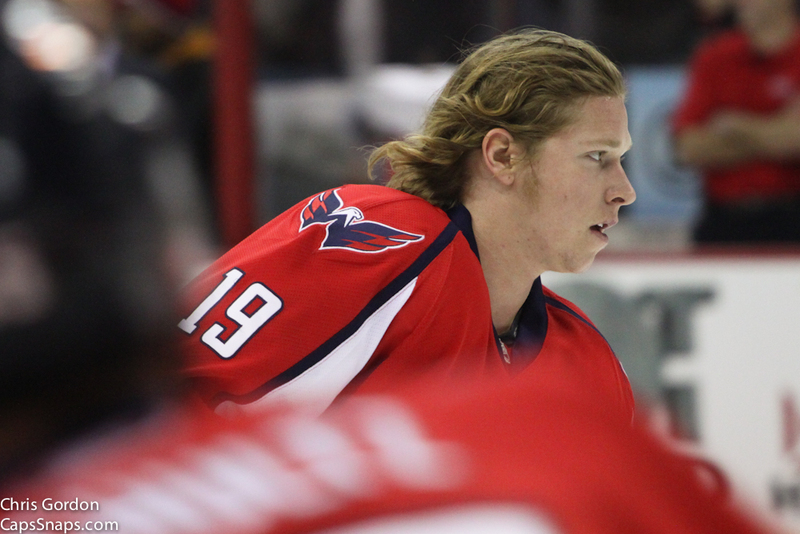 The Swedish Calm Before the Storm: Nick Backstrom, Gentleman. 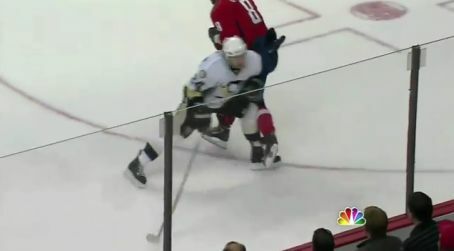 Milliseconds after the Cooke assault on Alex, Nicky was on that unrepentant gangster like white on ice. 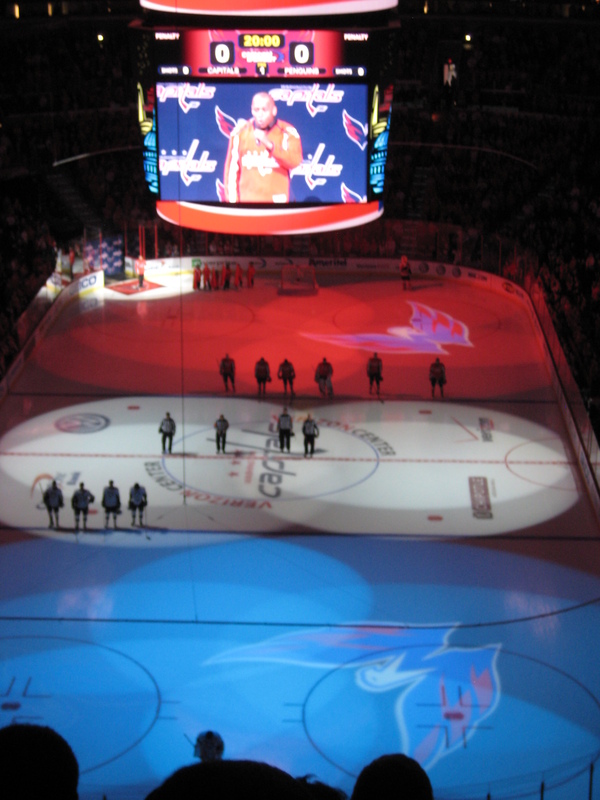 Existential Essentials: We watched the game from our usual high altitude perch, way up top in the 400’s. Yesterday we felt like vultures, looming high up over the goal that the Pittsburgh defended twice, at the ready to pick over the Penguin bones and remains. But from up there, it’s near impossible to compete with the lungs of the Goat and Horn guys but we tried our best at some fresh chants. Then we went practical: CALL: PRO-TECT NEU-VY! RESPONSE: AT ALL COSTS! Then we went existential: Call: CRUSH THEIR SPIR-IT! Response: BREAK THEIR WILL! OK – maybe we need some sensitivity training. But our seatmate on the other hand, Pigman, really made our day. He doesn’t like the Penguins one bit. They’re real fine our 409! Great post as usual, guys. Just wanted to say hi – it was great meeting you at the game yesterday (this is Holly, lover of Detroit, who met you with Peter after the 1st yesterday). Stop by Iron Horse for a beer before or after a game some time! Holly – Indeed, the pleasure was all ours and you have yourself a deal; root beers @ the Iron Horse and we’re buying!